One snack here, another drink there, and before you know it, the utensils have been spilled, the peanut butter isn't where you left it, and there's a loaf of bread in the cooler. Before you pull your hair out, start organizing. When you organize your kitchen at the campsite, you can worry less about clutter and focus more on having a great time relaxing and cooking with your family. 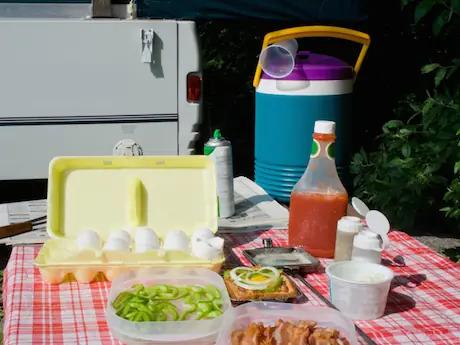 Use these four camp kitchen organization tips on your next trip into the woods. Not only does this make it easier for you, but for your little ones as well. For example: pack a bag for the kids, with carrots, celery, peanut butter, apples, trail mix and other snacks. If they know they can pull from this bag when they want a snack, you may have less of a mess on your hands. An old coat rack: Bend the arms of a metal coat rack, and use them to hang paper towels, cups and other kitchen items. An old shower caddy: Hang a shower caddy on the pole of a built-in shelter or nail it into a tree and then use it to hold your ketchup, salt, pepper, and more. A bathroom organizer: With multiple pockets, this makes for the perfect kitchen organizer. Use it to store things like silverware, napkins, cloths, matches and multi-use tools. Crates: Stacked milk crates are great storage items—use them for packing and then stack them for storage when you arrive.